Millions of small, beautiful, colorful songbirds that live in the tropics for most of the year venture north each spring to Pennsylvania to nest in our deep, quiet forests—forests that are now in danger of being fracked apart into industrial zones of natural gas extraction. Pennsylvania’s forests provide nesting habitat for 17% of the world’s Scarlet Tanagers. Photo by Jake Dingel, via the PA Game Commission. The names of these birds are often described by their vibrant colors: Black-throated Blue Warbler, Scarlet Tanager, Cerulean Warbler, or Rose-breasted Grosbeak. Here, in the deep remnants of Penn’s Woods, they find an abundance of caterpillars and other insects that are critical protein for raising baby birds. Once the young are fledged and finding food on their own, the parents and juveniles head back south in early fall to their “non-breeding” habitat, which is more accurately called the Neotropics; that is, the New World tropics of the Caribbean, Central America and South America. Most of these Neotropical migrants cannot nest successfully in small woodlots or fragmented forests, and depend upon large, undisturbed tracts of woodland that we call “core” forests. These are forests that are at least 300 feet from a permanent edge – such as a road, utility corridor, or housing development. Pennsylvania still has some very large forest blocks, primarily in the northern tier of the state, that serve as bird “nurseries”—places where the nest density is high and many species are successfully fledging young. A recently-completed Pennsylvania Breeding Bird Atlas is undergoing analysis by many researchers, and the data is helping us to identify the “best of the best” places in the state needed to sustain populations of our Neotropical visitors, for which we have a North American responsibility. Not surprisingly, these quiet, large blocks of forest are also favorite places for humans to use for passive recreation, relaxation, and spiritual renewal. If you want a quiet, peaceful place to escape the modern world for a weekend, look for places frequented in June by Blackburnian Warblers or Blue-headed Vireos. 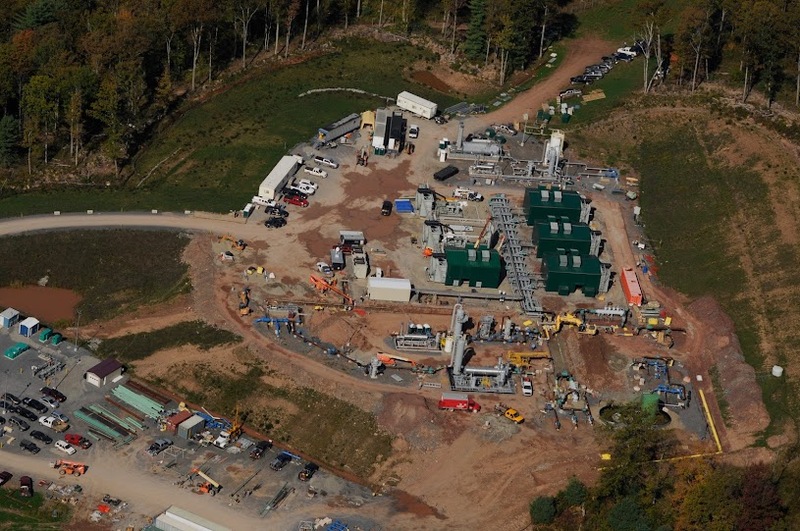 Unconventional drilling and key forest songbird habitat in Pennsylvania. To access the legend, layer descriptions, and other tools, click on the expanding arrows icon in the top-right corner of the map. Since many populations of our Neotropical species have been dramatically declining over the past 50 years, we need to protect as much nesting habitat as possible. In 100 years, we will probably see many species disappear from Pennsylvania altogether due to fragmentation and climate change. Our northern forest blocks may be a last refuge for a number of bird and other animal species that cannot survive in our sprawling suburbs or the ecological changes that will come with a warming planet. Extensive gas infrastructure in forested Pennsylvania land. Photo by Pete Stern, 2013. Fracking is a heavily industrialized activity that not only causes short-term fragmentation, noise, and ecological disruption, but can lead to long-term ecological collapse of healthy, intact forest blocks. Birds are only one of many types of animals that are impacted by the vast array of fracking infrastructure that is becoming all-too-common in our state’s quiet and shady bird nurseries, trout streams, and recreation areas: widened roads letting in sunlight and nest predators; long, wide pipelines creating miles of permanent edge; thousands of acres of forest floor buried under compacted gravel pads; rain events carrying road and well pad gravel into sensitive headwater streams, burying aquatic life. We have precious few public lands left in Pennsylvania that have not been leased for mineral extraction. We must do all that we can to prevent leasing of lands where the state owns the mineral rights; and, where the rights are severed and owned by another, we must find compromises and solutions that keep as much of the forest intact as possible.